There’s more to this church feast tradition than just bringing a covered dish and overindulging. From where I stood, the food spread to the horizon, an unbroken plain of bounty that stretched from my 9-year-old eyeballs all the way to the far side of the church dining hall, where the coconut cakes and plates of brownies fell off the edge of the earth. Of course, at the time, I stood only four feet tall, pretty much even with the tops of the chipped and beloved folding tables at Lexington Avenue Baptist Church, High Point, North Carolina, circa 1971. So my perspective was off just a bit. Still, the spread at our occasional covered dish suppers seemed eternal. Fried chicken heaped up like brown mountain ranges. A dozen sorts of baked beans. Ham salad sandwiches with trimmed crusts, cut into little squares. Potato salad, broccoli salad, macaroni salad 10 ways. The tables were lined up end to end, like dominoes. Nudge a corner of the closest table, and the deviled eggs would jiggle 40 feet away. My friend Sonny didn’t believe me till I proved it to him. It’s called a “potluck” in some circles, but not down he-ah. In these parts, it’s a covered dish supper, whether served midday or evening. 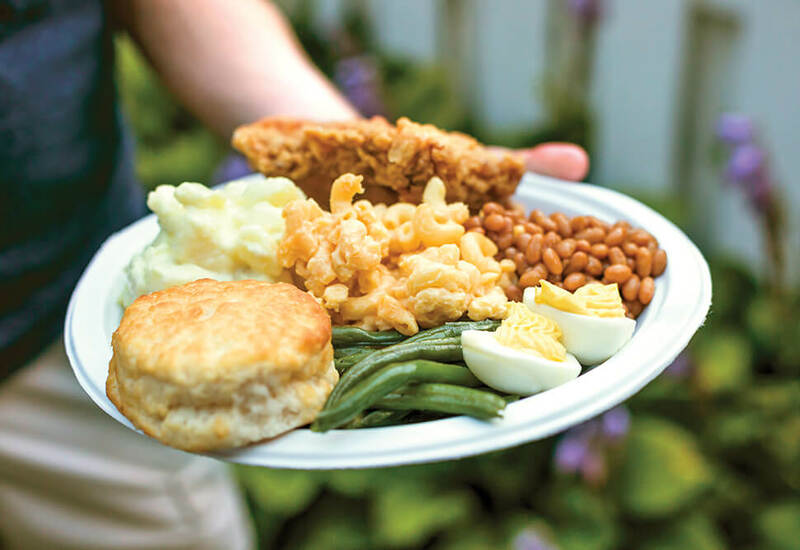 In the years since I could barely see over the sweet potato casserole, I’ve bellied up to plenty of covered dish suppers, in backyards and old cemeteries and a half-dozen church basements and dining halls, from the Great Smokies to Harkers Island. This much I’ve learned: There is little lucky about them. A covered dish supper might come off as a culinary lark — Y’all just bring a little something, don’t have to make a fuss — but it’s actually a choreographed display of kitchen skills, and a carefully planned spectacle. I’ve long thought it curious that church would be the site of such temptation to succumb to the most delicious of the Seven Deadly Sins: gluttony. But there’s no small serving of envy, either, and we’ll get to that. For a long time, I couldn’t quite figure out what it took to get a covered dish supper on the church docket. It’s not like they coincided with any ecumenical calendar. We had covered dish suppers to celebrate homecoming and the Fourth of July and the passing of the church budget, but sometimes they just appeared out of nowhere, like a giant congregational pick-me-up. A happy hour for teetotalers. Perhaps they were planned to entice young boys to come to church without complaint. They’ve certainly made an impression on my own son, Jack, who wondered aloud a few weeks ago why we hadn’t gone to a covered dish supper in a while. I couldn’t say. Perhaps they’ve fallen out of favor, been swept under the we’re-all-too-busy rug that has smothered so many traditions. I hope not, because those fetes loom large in childhood memories. And even for adults, they can be a weighty occasion. As kids, we never approached such an occasion without a plan. There were two modes of thought regarding pre-event preparation. Some kids skipped breakfast entirely. I went for a light, quickly digestible meal of, say, bananas and maybe a peach. I didn’t want my stomach to shrink before the serious eating commenced. From there, it was pure physics, calculated in the moment. You could tell from any fourth-grade Sunday school class who was skewed toward an engineering degree. While the adults fawned over whose three-bean salad looked the freshest, we kids focused fully on piling the maximum amount of the good stuff on paper plates flimsy as foil. Let’s see. I can use a slice of roast beef to create a tiny dam that will hold back the beet juice from tainting the sweet potato pudding. What’s that stuff? It’s got broccoli in it. Pass. Balance the chicken wing on top of the green bean casserole. Easy, now. Don’t smash the fried onion strings. Mama would never let us have those at home. It was a deftly executed brew of materials handling and tensile strength calculations, more finely considered than any geometry homework we would ever attempt in the years to come. Done well, it resulted in a nearly sphere-shaped aggregation of goodness, and nods of approval from our peers. Poorly executed, and the humiliation was there for everyone to see: the grease-bottom blowout when the paper plate disintegrates. The fourth deviled egg that tumbles from its succotash nest and squirts like a yellow pinball across the dining hall floor. The public shaming that results from spilling an overloaded plate, Styrofoam cup of iced tea, and three different kinds of desserts down the back of the choir director. And at the end of it all, I’d walk to the car slowly, trailing my parents, pants unbuttoned and belt slapping, convinced that my stomach was going to split like a dropped watermelon. Back then, of course, it was all corn pudding and innocence. I didn’t understand the social pressures a covered dish supper conferred on adult participants. Despite its “come one, come all, and bring what you can” gestalt, don’t think for a second that there’s not a caste system at play. You can see it in the ignored and cold-shouldered dishes. The Kraft Mac & Cheese untouched beside somebody’s cousin’s grandmother’s oven-baked version in a perky white casserole. The passed-over grocery-store veggie tray. Coleslaw in a deli container. I once saw a nice church lady segregate the obvious and not-so-obvious store-bought items and relegate them to the end of the serving line, after the biscuits, alone on their own table like some Island of Misfit Side Dishes. And these days, there’s even an arms race of fancy vessels custom-made for mobile dining. 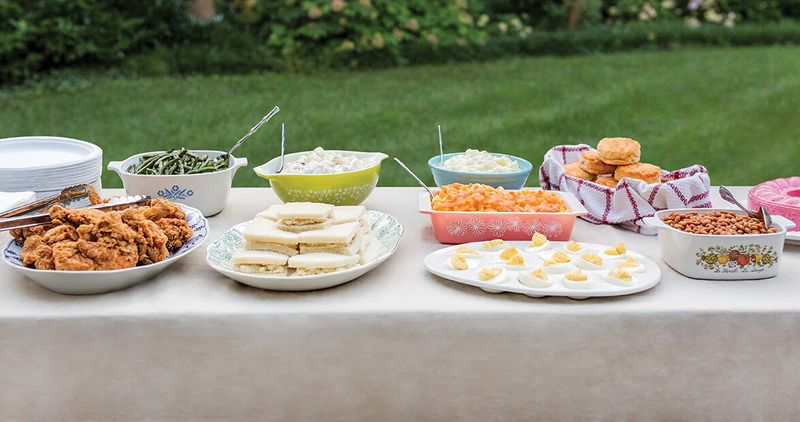 Folks show up with hand-painted serving platters and Lucite deviled egg trays engraved with their names like the landed gentry. Where I come from, that’s called putting on airs. Show me an old Pyrex dish identified with a strip of masking tape bearing a sturdy name such as “Doris” or “Pearl” and I’ll put up an un-Christian fight for that last watermelon pickle. All of that was lost on me as the kid scheming to score the biggest piece of carrot cake on the table, but once I got married, had kids, and actually had to contribute to the communal feed, I began to sense the seedy, competitive underbelly of the covered dish supper. For a lot of years, there wasn’t time at my house to roll out chicken pastry. Julie and I were working two careers and raising two kids and whipping back and forth between swimming pools and soccer fields. We were lucky to get to Sunday school no more than 10 minutes late with Markie’s hair brushed and Jack not carrying a hatchet. More than once I parked in the far corner of the church lot to help Julie spoon Fresh Market pimento cheese into a hand-turned casserole dish, her brow fretted with shame. We’d garnish our faux homemade offering with a fancy spreading knife and maybe a shake or two of paprika, faking it in the Lord’s house. God was watching, but so was Mrs. Coltrane. Only one had a record of forgiveness. We tend to think of such rites of passage as universal here in North Carolina, like pulling over to the road shoulder when a funeral procession meets you head-on. It never occurred to me that folks weren’t born just knowing that ambrosia is a fruit salad, like they knew the sound of their mother’s voice. Not so. At a covered dish spread a few years back, a good friend of mine — from Maryland, please understand — was standing in line when his eyes fell on a pale pink concoction that shimmered in the light just so. Get serious, son. That would be a molded salad. Strawberry Jell-O and whipped cream, if I had to guess. Boy weren’t from around here.